Find your favorite mashed sweet potato recipe here. Mashed sweet potatoes are an easy and favorite way to prepare this super food. Of course everyone has a favorite ingredient(s) to add their own special touch to the recipe. Some are sweet and some are savory. 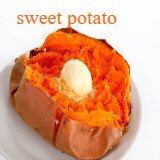 However you prefer your sweet potatoes, you'll likely find a recipe you like in our collection. This is the place to find, share, and comment on your favorites! Don't forget to tell us about your favorite recipe for mashed sweet potatoes and/or rate one of our recipes. Do you have a favorite mashed sweet potato recipe? Please Share it! If you have a picture, we'd love to see it, also. Your story will appear on a Web page exactly the way you enter it here. You can wrap a word in square brackets to make it appear bold. For example [my story] would show as my recipe on the Web page containing your recipe.